The new June/July issue is live~You can get it here. It is filled with tons of inspiration!!! This is a quick card I did using the same supplies! 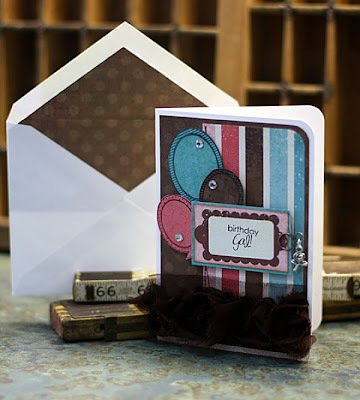 I added a Tim Holtz charm clip to the side of the greeting label. Love how it turned out. I'm really enjoying using stamps as my embellishments~Super cute!!! Thanks for stopping in and take a look at Ready, Set, Create~good stuff!!!! See ya soon!! love this one!! I would love to borrow your template of the die cut paper. I have been collecting die cuts and tracing them on posterboard to use later just like you taught me in one of the first classes I took from you! I always think of you when I do this. You always have the best titles and subjects for your layouts! I am totally love the colors and design on this. The card is wonderful is well. I love die cut shapes and papers. A weakness if you will. lol!! As if it all isn't a weakness. Snort. oh i love the balloooooons! 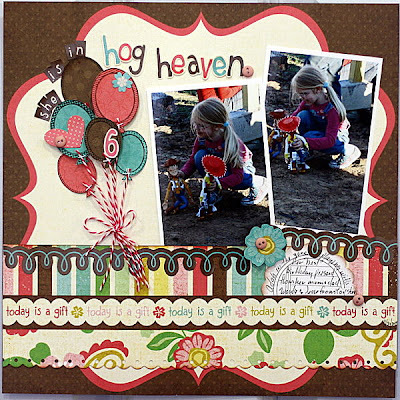 What an adorable layout and card! I just love all of the details! wow, stunning work!! Love all the balloons!! Cute layout and SUPER CUTE card :-) I really love the colors! These are great! You create well with any paper line.